Our little dragon clutches the side of the Pewter Cup, peeking eagerly into it as the spell is cast. Stars and moons show in the folds of our wizard's robes, and pouches full of magic hang from his belt. If you look closely enough at the page he's working from you'll see it's a chocolate-chip cookie recipe! 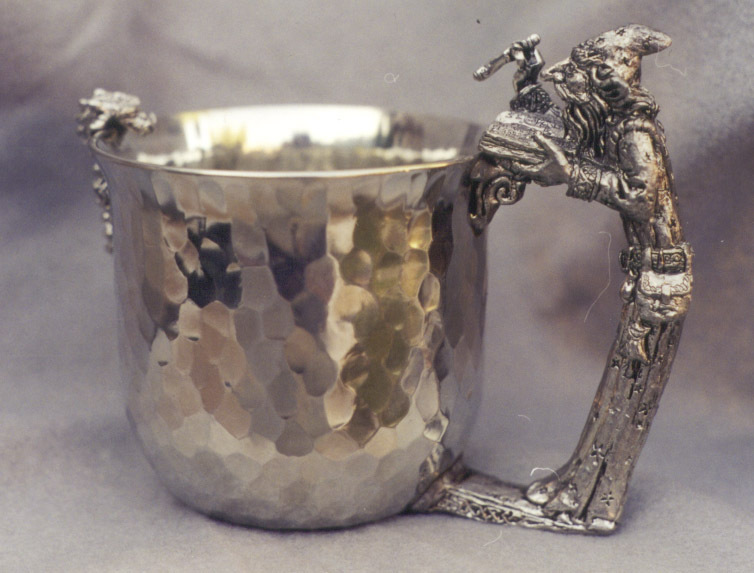 The Pewter Cup is 3 3/4 inches across at the rim and easily holds 14 ounces. We make it by hand from lead-free pewter so it's suitable for all liquids. Keeps your ale cold (and your coffee maybe too hot)!